We have a steady supply of quality tanned coyote faces. These coyote faces come from Canadian coyote skins that are used to make collars for top-of-the-line parkas. They are ideal gift ship items for children and are ideal for craft projects. The select faces have better eyes, ears, and noses than the #1/2 faces. The #1/2 faces have noses that do not lay as flat and may not be as full faced as the select faces. The #3 faces have more defects. The reject quality coyote faces are suitable to fly fishing or other crafts that do not require a complete face. 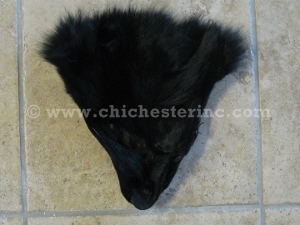 One dyed black coyote face is measured to be 8" long, 6.5" wide and weighed 0.14 lbs. Coyote are not an endangered species. 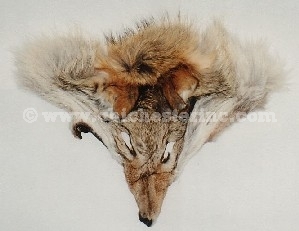 Click HERE for Coyote Face Masks. Click HERE for Coyote Hides. Click HERE for Coyote Tails. Click HERE for Coyote Scrap. 100 large coyote faces weigh approximately 15 pounds.